I made these ATCs after I was playing around with Some 13 Arts and Coloringz spray mists on a couple of pieces of A4 watercolor paper from the Bloom Pad. I hadn't intended to make anything, but I so liked how the pages looked when they were dry, I decided to make some ATCs from the paper. I cut up some chipboard coasters as the backers. For the birds/butterflies, I used paper from The Flying Unicorn Nature's Garden papers in the Small Art, Big Passion September kit. I also used some metal adornments from The Flying Unicorn and Finnabair. The hemp twine came from - you guessed it, The Flying Unicorn. I also used some stencils on the paper and Texture Paste for just another layer. 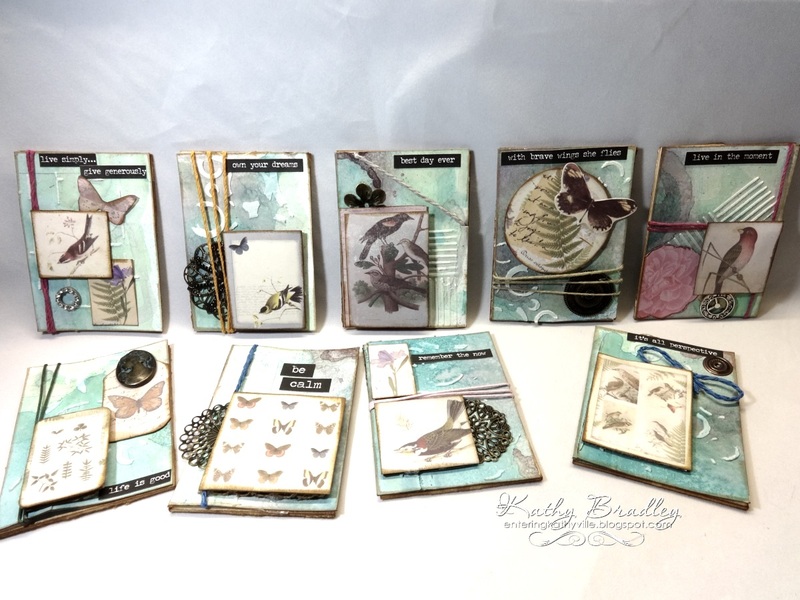 Bird/Butterfly prints: Nature's Garden paper in the Flying Unicorn Small Art, Big Passion September kit. Wow Kathy! What a fabulous collection of ATC's! I too would love to see close ups to admire all the hard work you put into each and everyone of them! Oh I can see why you wanted to make something with these papers - they're beautiful! Love your layered work on top too. Thanks for your continued support too. I really appreciate it!